If the CD is loaded, turns to CD mode. If no CD, it displays “No Media” for 3 seconds and returns to the previous mode. Press this button for less than 0.8 seconds to activate ‘RDM’ mode and more than 0.8 seconds to activate ‘ALL RDM’ mode. ALL RDM (MP3/WMA Only) : All files in a disc are played back in the random sequence. Press this button for less than 0.8 seconds to activate 'RPT' mode and more than 0.8 seconds to activate 'FLD RPT' mode. RPT : Only a track (file) is repeatedly played back. FLD RPT (MP3/WMA Only) : Only files in a folder are repeatedly played back. Press button for less than 0.8 seconds to play from the beginning of current song. Press button for less than 0.8 seconds and press again within 1 second to play the previous song. Press button for 0.8 seconds or longer to initiate reverse direction high speed sound search of current song. Press button for less than 0.8 seconds to play the next song. Press button for 0.8 seconds or longer to initiate forward direction high speed sound search of current song. Do not insert a CD if CD indicator is lit. Press button to eject the CD. This button works regardless of ignition switch status. Insert a CD label side up and gently push in while ignition switch is on ACC or ON. 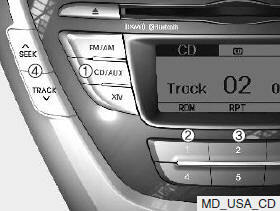 The audio automatically switches to CD mode and begins to play the CD. If the audio was turned off, audio power will automatically turned on as the CD is inserted. This audio only recognizes 12cm-size, CD-DA (Audio CD) or ISO data-CD (MP3 CD). If UDF data-CD or non-CD (e.g. DVD) is inserted, "Reading Error" message will be displayed and the disc will be ejected. Play each song in the CD for 10 seconds.To cancel SCAN Play, press this button again. Displays the information of the current song. Audio CD : Disc Title/Artist, Track Title /Artist, Total Track. Press button to move to child folder of the current folder and display the first song in the folder. Press / buttons to move to the folder displayed. It will play the first song in the folder. Press button to move to parent folder of the current folder and display the first song in the folder. Press / buttons to move to the folder displayed. 1. Song playing order : 1 to 14 sequentially.